The flavors in a Chinon run the gamut from red and black berries to plums, white pepper, bramble, smoke, flint, leather, tangerine pith, sweet spice and earth. While there are no official hierarchies, the wines, mostly red, are understood as falling into two categories: the precocious ones, charming bistro wines, best served chilled and grown in the alluvial plane along the Vienne River; and the complex, structured wines grown in the clay, gravel and chalky tuffeau soils of the cliffs leading up the Loire Valley floor. In the hands of the right vintner both can be engaging and lovely, but their character will undoubtedly reflect where they were grown. The more complex Chinons give the impression of being full-bodied, yet tend to be full in flavor rather than weight, especially when compared to cabernet sauvignon. Over the course of ten to thirty years, they will evolve from tannic with dark fruit flavors and hints of graphite and dried leaves, to something, soft, elegant, and perfumed. The quiet nobility of a fine Chinon is a direct result of this persistent arch toward refinement. The good news about Chinon is that it is one of the few regions where the wine world’s trophy hunters and treasure hunters dine at the same trough. Collectible bottles from its most revered producers, the likes of Domaine Baudry, Domaine Olga Raffault, Domaine Breton, Domaine Philippe Alliet and Domaine Charles Joguet, can be found for as little as thirty dollars. Examples dating back two or three decades can be found for twice that amount. I am not sure why these wines present such a stunning value - maybe because there are no grand or premier cru designations, or because Chinon has become synonymous with simple wines served by the tumbler. Regardless, when friends say they want to start a wine collection, age worthy Chinons are precisely the kind of wines I suggest they seek out. They’re delicious and compelling without being too dear, and they’ll only get better if you forget about them for a couple of years. If basic Chinon is bistro wine, then bottles from Baudry, Raffault, Breton, Alliet and Joguet are no doubt of the haut-bistro variety. Prized vineyards, attentive farming and traditional vinification elevate these wines into the realm of treasure hiding in plain site. 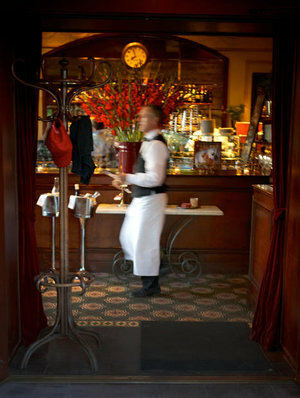 Pair them with your favorite steak frites or recipes from Bouchon, the classic tome celebrating the haute-bistro cuisine of Thomas Keller’s Yountville restaurant. 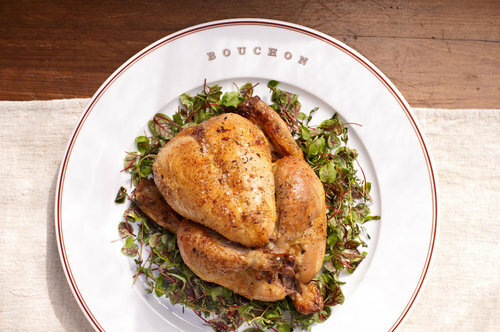 My go-to dish with these wines is the Poulet Rôti Forestière, Roast Chicken with a Ragout of Wild Mushrooms from the Bouchon cookbook (recipe below), which is remarkable for the way it evenly seasons the entire bird and encourages the skin to crisp and turn golden. It also may be the most accessible recipe Keller has ever published. It requires little more than soaking small chickens in a fragrant brine, roasting them at high heat and sautéing the garnish. The succulent flavorful meat and earthy chewy mushrooms are the perfect foils for the Chinon. Begin the meal with a rosé from the region, preferably from one of the producers above, and know that if you are lucky enough to have leftovers, both chicken and the Chinon will be better the next night. Combine all the ingredients in a large pot, cover, and bring to a boil. Boil for 1 minute, stirring to dissolve the salt. Remove from the heat and cool before using. Rinse the chickens under cold water. Put the chickens in the pot of brine, weighting them with a plate if necessary to keep them submerged. Refrigerate for 6 hours, then remove the chickens from the brine (discard the brine), rinse them and pat them dry with paper towels. Season the insides with a light sprinkling of salt and pepper. Truss the chickens and let them sit at room temperature for 20 to 30 minutes before roasting. Meanwhile, prepare the jus (see recipe below). Season the outside of the chickens with a light sprinkling of salt and pepper. Place one heavy ovenproof skillet, about 10 inches in diameter, for each chicken, over high heat. When the skillets are hot, add a tablespoon of canola oil to each one. When the oil is hot, put the birds breast size up in the skillets, and then into the oven with the legs facing the back of the oven. Roast for 40 minutes, checking the chickens every 15 minutes and rotating the skillets if they're roasting unevenly. After 40 minutes, check their temperature by inserting an instant-read thermometer between the leg and the thigh: the temperature should read approximately 155°F (the chicken will continue to cook as it sits, reaching a temperature of about 165°F). When the chickens are done, remove them from the oven, add the thyme leaves to the skillets and baste them several times with the pan juices and thyme leaves. Let sit in a warm spot for about 10 minutes. Keeping each type of mushroom separate, trim away any tough stems and tear larger mushrooms into smaller pieces. It is important to cook each type separately, since cooking time will vary. Divide the remaining ingredients proportionately according to the amount of each type of mushroom you have. Coat a large sauté pan with a thin film of canola oil and place it over high heat. When the oil begins to smoke, add the first batch of mushrooms, season with salt, and sauté for a about a minute. The mushrooms will absorb the oil; they should not weep any liquid at this point. Add the appropriate amount of butter, shallots, thyme and black pepper, and sauté, tossing frequently until the mushrooms are tender, 2 to 4 minutes. Transfer the mushrooms to paper towels to drain. Wipe the pan out with a paper towel and cook the remaining mushrooms in batches. When you are ready to serve the chicken, return the mushrooms to the skillet with a ¼ cup of chicken jus and bring the liquid to a simmer over medium-high heat. The wild mushroom ragout can be served family style in a bowl, or more formally in the center of a plate beneath the carved chicken as described below. Coat a medium sauté pan with a thin film of canola oil and heat over medium-high heat. Add the chicken thigh, necks and wing tips to the pan. Sear for three minutes on each side, until golden. Add the carrots, celery and shallot and cook until the aromatics vegetables soften, stirring occasionally, about 5 minutes. Pour the water into the sauté pan, bring the water to a boil, then lower the heat, partially cover the pan with a lid, and let the broth simmer for an hour. Strain the broth through a mesh sieve into a small saucepan. Place the saucepan over medium-high heat, bring the broth to a boil and reduce the it until you have approximately one cup of jus. Season to taste with salt and pepper. The dish can be served on individual plates by ladling one quarter of the remaining jus onto four plates, arranging the mushrooms in the center, then placing two pieces of chicken over the mushrooms and garnishing with a sprig of parsley and a sprinkling of sea salt. Alternatively, it can be served family style on a large wooden platter. 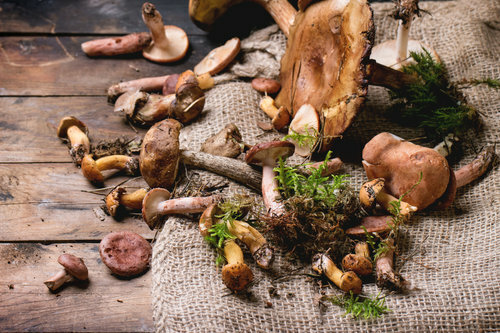 Arrange the mushrooms in the center and place the carved chicken pieces around the mushrooms, garnish with parsley and sea salt and pass the jus around the table in a small bowl with a ladle.